Better Call Saul — What’s Next? I’ve been thinking about the Season 3 finale of Better Call Saul for a week now, and I’ve finally gotten past my emotions at what happened in the episode entitled Lantern, and I’ve started to muse about what the fallout will be for our characters in Season 4. Therefore, predictions and thoughts about Season 4 will take up the bulk of this post, but I have to get a few things off my chest about the events of this episode first. Kudos to the young actor, Gabriel Rush, who played young Chuck reading to Jimmy in the tent in the first scene. I was just amazed at how amazingly his voice mimicked Chuck’s voice. I have no idea if this is a natural way this actor talks, the result of some audio technology or just real talent, but I hope this kid gets some great roles in the future and has an awesome career. It was almost too convenient that Hector’s pill bottle ended up at Nacho’s feet. Since we already know what condition Hector is going to be in within a few years, the biggest question here is how much Gus guesses about what Nacho was up to. I was surprised that this episode brought us almost a complete turn-around for Jimmy, attempting to make amends to Chuck and going to such personally humiliating lengths to smooth out things between Irene and her friends. Kim’s accident caused more than one person to do some serious soul-searching. I’m wondering if Francesca will fade into the background for a while, until we get to the point of Jimmy opening his law office under the name of Saul Goodman. Or will we see what she’s up to next season, even if she’s not working for Wexler & McGill? I just re-watched Lantern last night and I still don’t feel like I agree with the overwhelming opinion I’m reading on the Internet that Chuck deliberately killed himself. I felt like Chuck is portrayed as a man in a semi-catatonic state who accidentally caused his own death. Remember, we’ve seen him lose consciousness more than once and even be in what appeared to be a coma due to this illness. I am not familiar with mental illness manifesting itself in that way, but he sure didn’t look like he was intending to knock the lantern over, to me. If he intended to kill himself, I can think of a few easier and less painful ways than setting the house on fire. I wonder if his pill bottles would contain enough medication for an overdose? Or what about hanging himself? I suppose electrocution was out of the question? The almost catatonic expression on Chuck’s face makes it hard to believe that kicking the lantern over was purposeful, though it does explain why Chuck didn’t run out of the house when the flames started to spread. I finally concluded that the show’s creators recognized that this would be a hard scene to watch for people who have had a family member who took their own life, or for people who have attempted suicide and survived, and that’s what led them to choose this rather unusual scenario. Was he faking being better in these recent episodes, or was he really making progress? He truly had the electricity on, but the doctor seemed surprised at his progress and we saw him evidence discomfort when others were not watching. Two major events seemed to precipitate the sudden turnaround and downfall, and I’m wondering which was the bigger reason for his downturn: being ousted from the law firm he founded, or his final interaction with Jimmy? When I watched it again I realized that he kept feeling for hidden electricity, then he would break a hole where he presumably felt some and there wouldn’t be any wires. He finally found one wire but he made a lot of holes where there was nothing, which should prove to a rational person that the feeling was not caused by the presence of electricity. What’s next in Season 4? What happened to the check Howard gave Chuck? Did he cash it? If not, is there a legal record of it anywhere? Is it possible that Howard can pretend it never existed and keep the money, if the check burned up and no one else knows about it? And does this mean Howard is not obligated to pay the balance of the settlement money? Being a lawyer, I assume Chuck has a will? Who inherits whatever is left after the fire is put out? Jimmy? Rebecca? Will the $3 million check that Howard wrote be part of that estate? If Jimmy inherits $3 million, it will make it easier for him to manage financially while he waits to have his law license reinstated. We know what happened at Chuck’s house that night. But to the outside world, we have a man who was making significant progress in his battle with mental illness and had recently retired, and then his house burns down and he (presumably) dies. Is it plausible that whoever investigates the fire and the death might suspect Jimmy is responsible for the fire? Especially if Jimmy ends up inheriting, there is definitely motive someone could point out. Is it further plausible that Howard could omit certain facts, when the authorities ask, and thus kill 2 birds with one stone: save himself the cost of having to pay Chuck (or Chuck’s estate) to buy out his share of the law firm, and also get revenge on Jimmy by implicating him in what would be 2 crimes: arson and murder? Or is Howard above that kind of behavior? But regardless of whether Jimmy inherits Chuck’s estate or whether he’s suspected of causing Chuck’s death, Jimmy is going to have to deal with Chuck’s last words to him. He’s going to play that back in his head over and over, and start believing that it’s true that Jimmy hurts people. Jimmy hurt Irene and her friends. Jimmy was ultimately the cause of Kim’s drive to overwork herself, which led to her accident. Jimmy may come to believe his actions toward Chuck caused his suicide, especially if Howard doesn’t ever come clean about how he forced Chuck out of HHM. 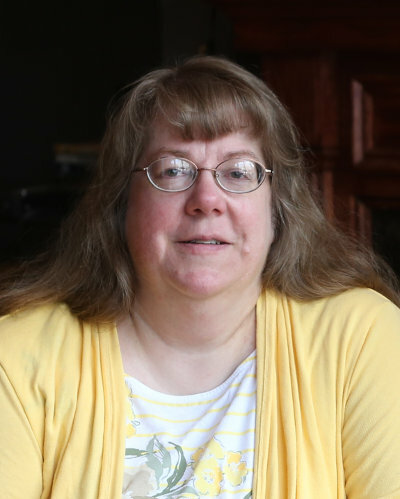 Tragically, Jimmy never will learn that his mother’s last words were his own name, and may end up distancing himself from the one person who truly loves him (Kim) in an effort to protect her from himself. I honestly have no idea what’s next for Kim. I really thought we’d see regretful Kim, remorseful about the consequences of the Bar hearing, leave the increasingly vindictive Jimmy/Saul. But now we have remorseful Jimmy and relaxing Kim, and they seem closer than they’ve been all season, so it’s anyone’s guess where this leads next season. The one thing that’s clear is she might be the only thing that’s keeping Jimmy from becoming Saul, but we don’t know if she has to leave in order for him to complete the transformation or will he drag her down with him? And if she leaves, where does she go? I’m anxious to find out. We’ve noticed Gus has an interest in finding and recruiting people who have certain qualities that he can employ in his business empire. We saw him do it with Mike and we know how that ends up. He seems to have his eye on Nacho also, and I’m thinking Gus and Nacho’s relationship will deepen in Season 4, but I’m not sure what that means for Nacho. I like Nacho, but we don’t see him in Breaking Bad, so is it possible he gets himself killed before we get to that point in time? Also, am I right that Gus and Bolsa arrived at the meeting place in the same car? And then Gus encourages Bolsa to leave, saying, “You can’t be seen here,” or something like that. So now Gus needs a ride home . . . do you think Nacho will drive him? But I’m wondering about Hector — will they do enough tests at the hospital to determine he was taking Ibuprofen instead of the Nitro pills he thought he was taking? Would his doctor have warned him that taking Ibuprofen is not a good idea for a heart patient, and that it can increase the risk of a stroke or heart attack? I guess it won’t matter — they can’t do a full analysis of his stomach contents like they could if he died and they performed an autopsy, so it’s likely no one will find out about the switch. I was disappointed that we didn’t see Mike in this episode. I love watching Mike figure stuff out and I hope next season won’t be just Mike becoming more and more involved with Gus. I hope that Lydia’s comment (“If you think he’s just a drug dealer, you don’t know Gustavo Fring.”) sparks Mike’s interest to find out more, and we’ll see more of Mike being Mike and also learn more about Gus and his business empire. From Better Call Saul season 3, episode 8, Slip, we see Jimmy helping one of his fellow community service workers to get some time off and still get credit for working his hours. Jimmy makes clever observations about the drug dealer and the supervisor in order to manipulate them into doing what he wants. The supervisor believes he has no choice, otherwise risking possible financial ruin, and the drug dealer walks off to where-ever he’s really going, saying it was the best $700 he ever spent. And Jimmy gets to rest his back, still get credit for working his hours of service, and a $700 payoff. In one of the first interactions we see with Saul and Walter White in Breaking Bad, Saul visits Walter in his high school chemistry classroom, having tracked him down because he sees a need he can fill and make a profit at the same time. He proceeds to explain how he can help Walter make more money and keep the money that he makes, and offers his services as a solution. In both of these cases, we see Jimmy/Saul the Entrepreneur, performing the most crucial task of a marketing genius: identifying a problem and proposing a solution that benefits both the “customer” and the entrepreneur/marketer. Jimmy uses his ability to read people to be able to do this so effectively. I love books and I love that older brother Chuck read aloud to Jimmy even when Jimmy was approaching or had reached the age at which he could read himself. Reading and being read to have produced fond memories in my life, both of my own childhood and that of my kids. So, in honor of parents and older siblings that read aloud to their children and younger siblings, I wanted to close with some information about The Adventures of Mabel, the book we first see in the first episode of the season, entitled Mabel. 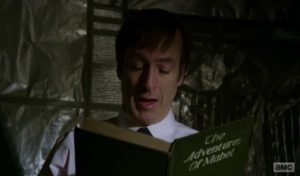 I thought it was so fitting that the last episode shows a flashback to Chuck reading this book to Jimmy. I’m sure this book has become an instant collector’s item after being mentioned on this show — I found online prices of hardcover editions approaching $40. But it’s passed out of copyright into the public domain, so you can read a digital edition for free if you want. They have versions for pretty much all of the ebook readers out there. Enjoy! Please comment below and tell me what you think about my theories or what you think will happen in Season 4, which I hear has finally been officially announced.